"I visited Yummy Wonton House and it sucked!" exclaimed Potman (make your own conclusions with that nickname) in the locker room prior to hockey on Wednesday night. Wow, that is a really bold and damming statement. I quickly asked why he thought it sucked. Well, he had a plate of fried noodles which were subpar. Fair enough. Probing a bit further, it appears he hadn't tried anything else. 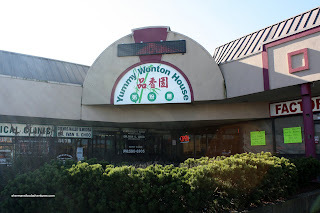 I quickly defended Yummy Wonton because I still believe they are one of the better places to find Chinese food out in North Delta. Sure, it doesn't compare to Richmond; but not many places do. Curious to see if his comment h ad any credibility, I decided it was time to visit Yummy Wonton again. I've been there not too long ago for Dim Sum and it was more than acceptable. Yet, I haven't had their regular food for almost 2 years. So I didn't only visit Yummy Wonton once, I went back 2 times to completely make sure and also to try enough items to make a fair assessment. 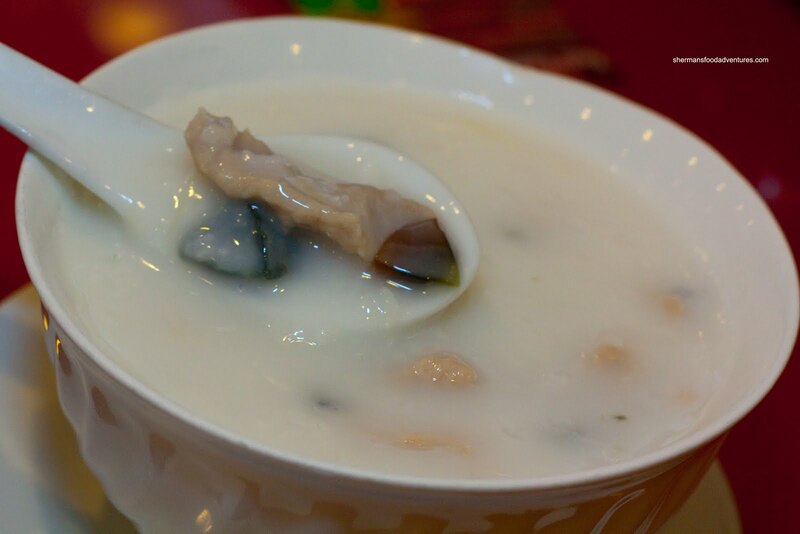 For my first visit, I got a bowl of Preserved Egg & Salted Pork Congee to start. The congee itself was decently thick with a good amount of ingredients. I found the taste to be balanced neither being too salty nor sweet. One thing I didn't like about the congee was the pork. It was fresh slices of pork rather than being brined in salt. Not a huge problem; but I really prefer salted pork. 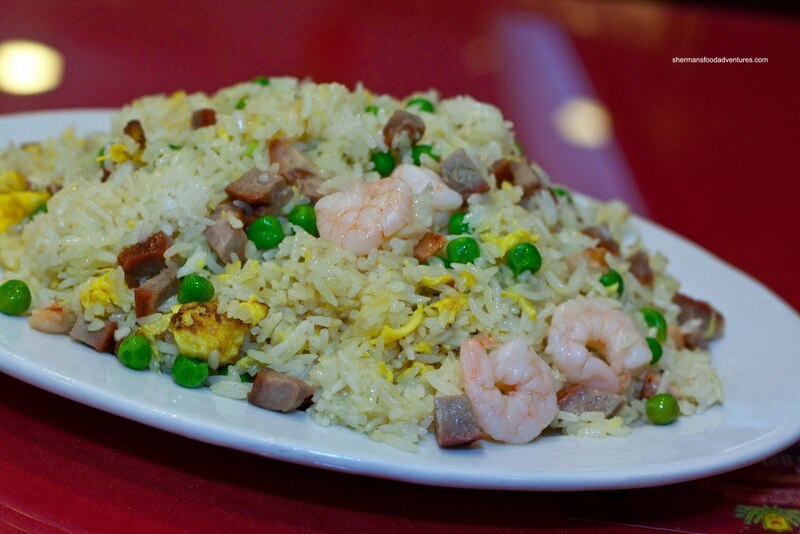 For my main, I had the BBQ Pork and Shrimp Fried Rice. As it arrived, the dish looked impressive with lots of properly cooked shrimp and meaty pieces of BBQ pork. Much like the first time I had this 2 years ago, the rice was a perfect texture being chewy and dry. The rice was pretty good, if not a tad too salty. On my second visit, I ordered the Chef's Wonton Noodles. Hey, their name is Yummy Wonton, let's see if they can back it up! If you're wondering why I didn't order the regular wonton noodles, it's because of cost. It is a whopping $6.90! $6.90!!! Sorry, that is too expensive in my books. So I chose the lunch special which was a more respectable $4.00. It included one piece each of shrimp, fish and scallop. 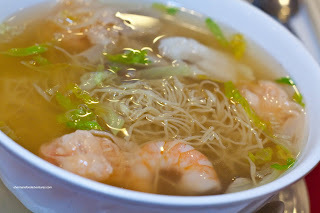 As with last time, the wontons were comprised completely of shrimp. You have to give them props for doing so. The wontons were actually quite good; but I wish they would de-vein the shrimp. The noodles were slightly past al dente and the soup was okay (probably a bit too salty). 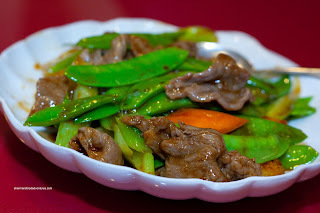 I also got an order of the Stir-Fried Snow Peas with Beef since a bowl of noodles is not enough... for me at least! Hey, this was a nicely wok-fried dish. The snow peas, carrots and celery were still crisp and vibrant. The beef was plentiful and properly tenderized. I liked this dish; but I found it to be too greasy. So my revists to Yummy have confirmed what I've known all along - it is decent Chinese food for North Delta. Sure, it ain't great Chinese food; but honestly, we're not talking about Richmond here. Hence, if you have reasonable expectations, then the food does the job. To be fair, sometimes even Hong Kong has trouble comparing to Richmond.